Bayshore Solutions is pleased to announce that the digital agency has earned the Google Premier Partner Badge for “dedication to digital media and to keeping clients on the cutting edge of advertising,” cites Allan Thygesen, Google VP of Global Sales & Operations. 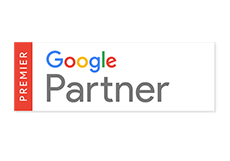 The Google Partners program provides accredited online marketing companies and professionals with support to help their clients be more successful advertisers online. Premier Google Partners is the highest level of certification and agencies that earned Google Premier Partner status and have met higher certification and company performance requirements demonstrating dedication and successful delivery in online marketing. Google Partner badged agencies receive access to resources, training events, promotional offers, professional networking, and other tools. “The Premier Partner Badge is both a symbolic and tangible way to differentiate, and comes with a higher level of service and commitment from Google,” Thygesen states. Learn more about Bayshore Solutions Google Premier Partner Agency capabilities and results here. Digital marketing agency, Bayshore Solutions, offers award-winning capabilities for custom web design, website development, e-commerce, and digital advertising. Founded in 1996, the website design and digital marketing company delivers custom web applications and marketing services to over 2,100 clients in 54 countries. Headquartered in Tampa Florida, the firm has offices in Denver, Colorado and Miami-Fort Lauderdale, Florida. Bayshore Solutions integrates technology and marketing services to ensure measurable results for customers.